My cousin Bob Filler with a perfect 24" red pulled out of the Indian Field mangroves yesterday. End of summer and early fall are always the best time of year to target schooling reds. We've got at least one 0.5 or lower tide almost every day this month in Matlacha Pass which means excellent tailing conditions for at least an hour or two. 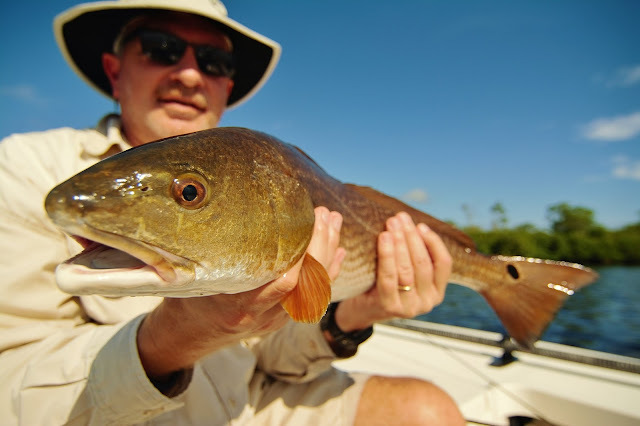 Check your tide chart and hit your favorite grass flat at least an hour before the water bottoms out and if the winds are calm, the redfish should be there. If the water is especially flat then it's time to break out the fly rods to avoid spooking them. The Herman Lucerne Memorial Tournament.